The RB 18 has been the first boat which has been produced by us for American market. During making the RB 21 Classic and RB 21 Cabin prototypes we started to work on designing with our partner from USA Roth Bilt Boats. 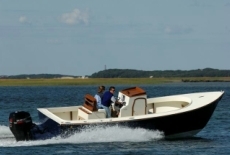 The RB 24 Classic boat has been designed fully by us for Roth Bilt Boats. We have used unique designing procedure which gave us possibility of getting known about real performance and manoeuvrability of the boat before the prototype has been made. As the result of this process we got interesting construction combining elegance with traditional look and very good manoeuvrability characteristic. RB 24 Classic has very firm construction – the hull has been designed according to ABS (American Bureau of Shipping) regulations for the speed up to 50 kn. With the 250hp Four Stroke Suzuki engine the boat achieves easily 43 kn. ensuring very big comfort. Thanks to exceptional shape of the bottom and the sides the boat performs very well on big wave and is dry. The hull is hand made with use of the best materials. Carefully, hand made stainless and brass hardware in connection with hand made teak elements (from the best quality of wood) give exceptional atmosphere and charm to the boat. The boat is to be used for daily cruising on all inshore and coastal waters. Thanks to the big strength it can also be used for offshore waters.